A CoreData shadow shop of domestic robo-advisers has concluded that automated advice is at least six to eight months away from "working" for the typical Australian consumer. Speaking at the Calastone Connect Forum in Sydney yesterday, CoreData principal Andrew Inwood said Australian robo-advice processes are "pretty prosaic" and have not yet managed to deal effectively with 'know your client' rules. CoreData has spent the past six months conducting a shadow shopping exercise on the Australian robo-advice sector, Mr Inwood said. "We've been communicating with them, asking them questions, going through the process of setting them up, closing the funds down, opening them again, putting in money, changing systems, and changing bank accounts," he said. "Once you open your account you’ve got to go through the whole process of identifying yourself as a client, which is horribly manual," he said. Clients are often required to fill in a paper form and send it to the robo-advice company in order to prove their identity, Mr Inwood said. There is only one exception – Acorns Australia – which has managed to circumvent lengthy processes by using the banks' existing knowledge, similarly to UBank, he said. "There is still a long way for [Australian robo-advice] to go. It’s not true of the US, and it’s not true of the UK – but it’s certainly true of Australia," Mr Inwood said. "We’ve kind of rushed into this space [in Australia]. A lot of people used to be [online financial] calculator businesses and they’ve rushed into this space to try and be the next robo-adviser. "But it’s not quite working. I would suggest that we’re six to eight months away from actually having it work." That is not to say there will be a "big future" for robo-advice in Australia, he said. 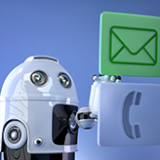 "It systemises and robotises the whole front end of the sales process. The bit which is expensive for the banks and implies risk for the banks," Mr Inwood said. "The bit where the mis-selling is – the bit where the ASIC inquiries are. The more that [wealth management firms] can do that, the better off they’re going to be. My sense is that this wave is coming but it’s still some way out."